Looking for a vehicle with great engine capability, affordable price, and safer features? Middletown Honda introduces the all-new 2013 Crosstour by Honda, a versatile crossover that has quickly become a family favorite in Mecahnicstown. We know that area drivers have a lot of options out there to choose from, but when it comes down to affordability (at purchase as well as throughout the car’s life) and safety there is no competition for the Crosstour. To prove our point, we have put together a breakdown comparison of the Crosstour and one of its main competitors, the Nissan Murano. The base price MSRP of the Crosstour is $27,230*, compared to the Murano’s $30,340. That’s a difference of $3,110! For such a wide gap in price you would expect to get more out of the Murano — but, you don’t. Get an EPA-estimated** 22 mpg in the city and 31 mpg on the highway, for a combined 25 mpg with the Crosstour, while the Murano offers less in every category: 18 mpg (city), 24 mpg (highway) and only 20 mpg (city/highway). When it comes to parking, especially parallel parking, it’s great to have some help. With the Crosstour, never worry about fitting into a tight spot by yourself. It features the electronic parking aid feature that comes standard in every model. This is not available in the Murano. Also not available in the Murano are manual air conditioning and a rearview camera. However, every Crosstour features both! What’s really exciting about the rearview camera is that it makes reversing safer and easier, knowing exactly what’s behind you and how far. Park with more precision, and with more confidence. Keep your vehicle safe from car thieves! Also not available on the Murano, the Crosstour features the vehicle theft deterrent system to protect your car when you’re not there. Keep safe with the Crosstour’s automatic headlights function, which is again, something that’s not available in the Murano. It also has an auto-off headlights feature, which helps in case it slips your mind to turn off your headlights! 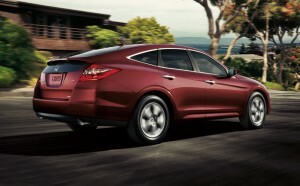 For more information on the new Honda Crosstour please contact us. “Like” us on Facebook and get the latest on special events, auto updates, and sales promotions instantly! We know that you have many options for buying a car, and we appreciate you choosing Middletown Honda. Our customer satisfaction is first-rate! * MSRP excluding tax, license, registration, $830.00 destination charge and options. ** 22 city/31 highway mpg rating for 2WD 4-cylinder models. 20 city/30 highway mpg rating for 2WD V-6 models. 19 city/28 highway mpg rating for 4WD V-6 models. Based on 2013 EPA mileage ratings. Use for comparison purposes only. Your actual mileage will vary depending on how you drive and maintain your vehicle.